Though I’ve lived in Japan for several years now, Fukuoka was never very high on my travel radar, nor was it particularly high on my list of culinary destinations. Other places and their more famous restaurants were always calling: Osaka, Hokkaido, Tokyo. I finally made it down there earlier this year to see what the fuss was all about, and now I can tell you – don’t make the same mistake I did. Just go! Gorgeous weather, scenery and people aside, Fukuoka deserves several days in your Japan itinerary for the food alone. Here are some local specialties you shouldn’t miss when travelling to this city. 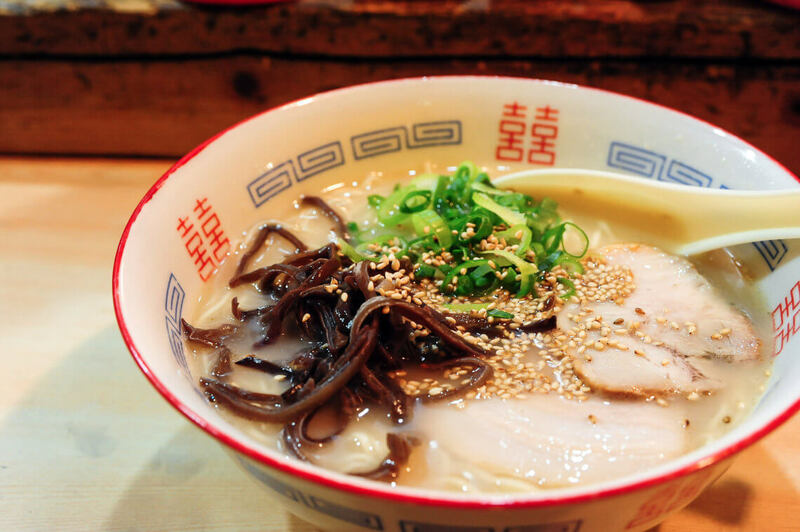 Tonkotsu ramen is one of Japan’s most beloved exports, and its birthplace is in Hakata. Eating a bowl of Hakata ramen when you’re in Fukuoka is non-negotiable! The heart and soul of Hakata ramen is in its broth. Pork bones, fatback and a whole host of other ingredients are simmered for around 12 hours until they break down into an ultra-rich, porky soup with fat globules floating on top, packed with enough collagen to keep your skin elastic for the next decade. Along with pork slices, marinated soy eggs and a showering of pungent green onions, it’s a wickedly fatty, gut-busting ramen bowl you’ll either love or hate. A word about the noodles: I like them skinny, and Hakata ramen noodles are as thin as they come. The local way to eat them is on the firmer side, and at most ramen shops you can usually ask for how done you’d like them. The best way to eat them is katai (firm) or barikatai (extra firm), since thin noodles tend to soften pretty quickly in the hot broth. This is also the reasoning behind kaedama – where you order an extra portion of freshly-boiled noodles, rather than supersizing your portions – this is so that your noodles don’t become too soggy. Hakata ramen can be overwhelmingly rich after a few slurps, but what keeps the eating experience interesting is the array of condiments for you to customize your bowl. You could grind on some sesame for an additional nutty depth. Did you want some salt and spice to your broth? Stir in a spoonful of karashi takana, mustard greens salt-pickled in chili peppers and lightly fried; or some red pepper paste. Perhaps you’d like to cut through all that richness – throw in some sour, piquant benishoga (red pickled ginger) instead. My favourite condiment, though, is raw garlic. Most restaurants provide a garlic press to grate raw allium directly into your ramen. Can anyone say bowled over? Ichiran may be one of the best places to begin your Hakata ramen journey – after all, Hakata is where the whole affair began. You haven’t truly experienced a food coma in Japan until you’ve had Ichiran’s ramen with a kaedama. Read more about ramen in Japan! In Japan, Fukuoka is the Promised Land of pollock roe. Also known as karashi mentaiko, spicy pollock roe most commonly consists of fresh roe marinated in salt and red chili peppers. It was first introduced to Japan in 1949 by Busan-born Toshio Kawahara, who adapted this Korean ingredient to Japanese palates. At its best, mentaiko is a jolt to the senses – gently spicy, umami-packed spoonfuls of intensely briny ocean sweetness. It’s available all over Japan, but I’ve never tasted mentaiko anywhere else that was as fresh and delicious as those in Fukuoka. Mentaiko is a popular ingredient, and you’ll see it in many dishes on izakaya menus. 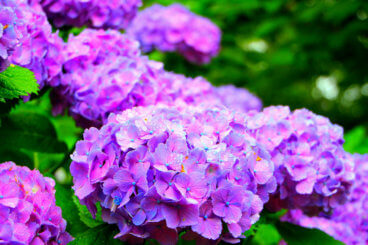 It’s gorgeous on top of a bowl of white rice for breakfast, or as an onigiri filling. A convenience store rice ball will be alright, but to take it to the next level, find yourself a shop specializing in rice balls. (I loved Onigiri Kabata in front of the Tenjin-Kita bus stop.) Another great dish is mentaiko pasta, which is like cacio e pepe‘s Japanese cousin. Then there’s mentaiko bread, available in bakeries – or you could mix up mentaiko and Kewpie mayonnaise, and broil it on toast for a fabulous drunken 3am snack. Mentaiko is also a fantastic accompaniment to sake. 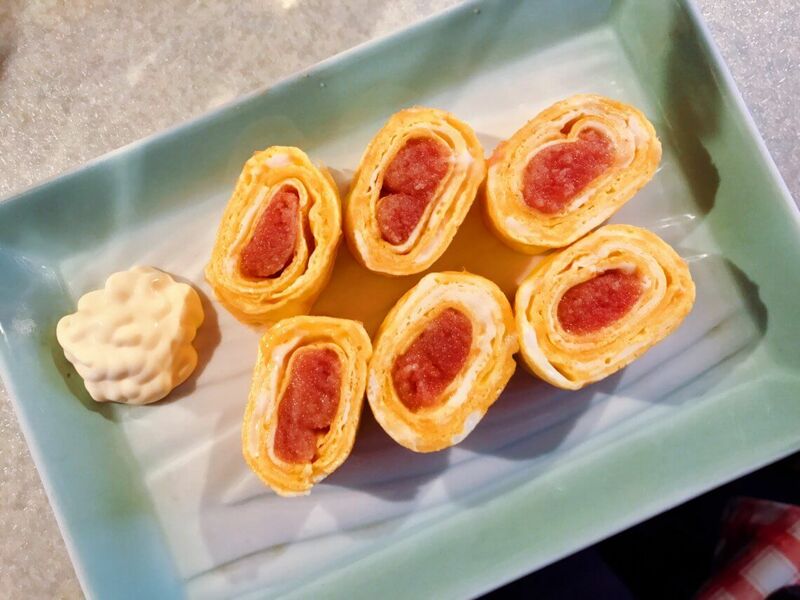 If you do drop into a yatai for drinks while you’re in Fukuoka, don’t forget to order mentaiko tamagoyaki – a rolled omelette concealing a creamy centre of spicy pollock roe. This being Fukuoka, there is of course a restaurant specializing entirely in mentaiko dishes. If you’re in town, check out Ganso Hakata Mentaiju. Their signature dish, the Mentaiju, is a rice bowl topped with with kombumaki mentaiko – that’s cod roe marinated and wrapped in kelp to you and me. Mackerel is a fantastically delicious fish, especially during the colder months when it becomes extra fatty. A rich, oily fish like mackerel tends to spoil faster than most white fish, so you’ll often see it grilled or lightly pickled. But the Genkai Sea facing Hakata Bay is home to some of the freshest, most delicious mackerel, so Fukuoka is one of the rare places where you’ll see mackerel eaten raw – straight from the sea to plate! One of the most delicious mackerel dishes ever is goma saba. 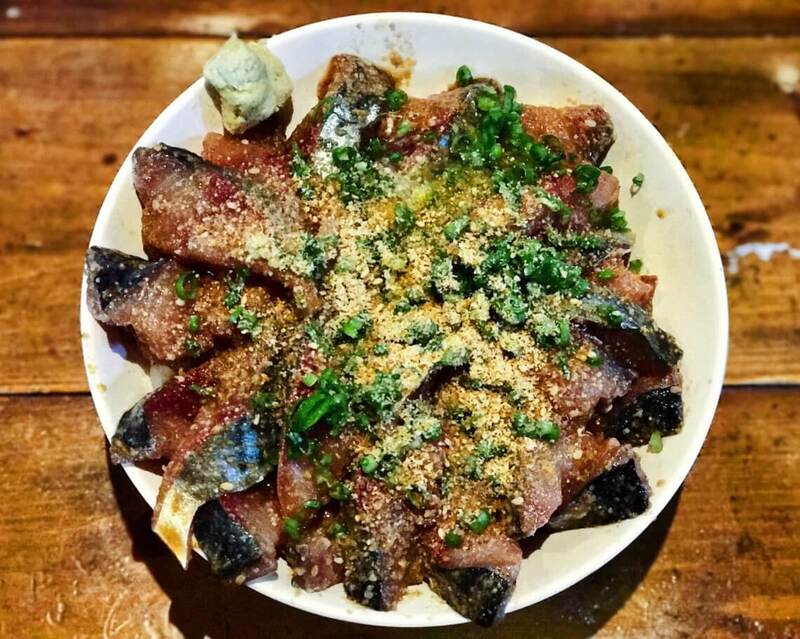 Generous slices of raw mackerel sashimi are tossed with a dressing made of toasted, coarsely-ground sesame seeds, soy sauce, mirin (sweet rice wine) and sake. Other variations include adding chopped green scallions, perilla leaf, seaweed, and grated ginger. It is utterly sublime on top of hot white rice, and also extremely tasty when eaten in the style of ochazuke, with additional dashi broth or green tea poured on. You’ll find goma saba at izakayas and restaurants all over Fukuoka – my favourite rendition so far was at a tiny little restaurant near the bus stop at the port on Nokonoshima. Though you can apparently find this on menus year-round, an izakaya owner I spoke to noted that he wouldn’t serve this dish during summer, since he considered the mackerel during this season to be less suitable for raw consumption. Anyway, I think it tastes best during the colder months! Read more about izakayas in Japan! A great place to try this in Fukuoka is Daigaku Udon in Akasaka, or Udon Taira near Hakata Station. Some popular toppings are maruten (deep-fried fish cake) and goboten (burdock root tempura). Why not try both? When compared to other Asian countries, Japan is notable for its lack of street food. Thankfully, yatai in Fukuoka continue to hold up the fort with their hearty, no-nonsense fare. Yatai are food carts which seat around 6 – 8 people, 10 if you’re sitting shoulder to shoulder with other diners. These street-side food stalls are the remaining bastions of street food in Japan, and I hope they stay in business for years to come. Depending on the yatai you visit, you could eat anything from stewed beef cartilage to mentaiko omelette. A particularly interesting local invention you should try, however, is yaki-ramen. It’s exactly as it sounds: ramen noodles are stir-fried with vegetables, pork, red-pickled ginger and egg, tossed together in a viscous, tangy brown sauce and a small serving of broth. Yaki-ramen isn’t pretty, but we’re not concerned with appearances here. 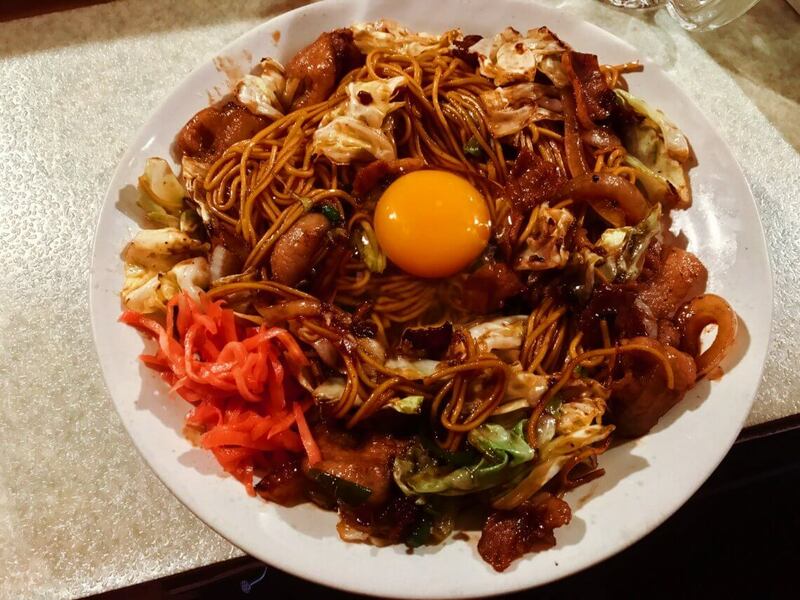 It’s a hearty dish, and a perfect way to cap a night of drinking at the yatai with your new Fukuokan friends. Finish and leave, stumbling full and happy into the night. Imagine it’s so cold outside that your ears are beginning to turn a violent shade of blue, and the summer sun feels like a distant memory of the last century. What you need at times like this is food that fills your stomach and heart. Luckily, Fukuoka has just the remedy for you: here’s where hotpot heaven is. Nabe, or Japanese hotpot, is the classic cold weather crowd-pleaser, and Fukuoka takes it to the next level with motsunabe. Motsu here refers to cow and pig offal, but trust me – it’s anything but awful. Tripe and intestines, along with vegetables such as leek, chives, and cabbage, are slowly simmered in an ultra-flavorful broth spiked with soy sauce, garlic, perhaps some miso, and a potent hit of chili peppers. Eat your way through all the good stuff, but make sure you leave some broth behind to deepen and sweeten throughout the meal. Towards the end, throw in some rice or champon noodles for a gloriously hearty, gut-busting finale to your dinner. Japan doesn’t love discussing its relationship with its neighbors, China and Korea, but the influence of these two countries on Japanese cuisine is undeniable. Just look at gyoza, the Japanese analogue to Chinese jiaozi dumplings. But it’s no surprise Japan took to gyoza – who doesn’t love dumplings? Fukuoka was one of the first places in Japan to adopt and make gyoza their own. One of the most delicious ways to eat gyoza in Fukuoka is in the hito-kuchi or bite-sized style. Take your average pork-and-vegetable dumplings, make them extra juicy and garlicky, shrink them to an adorable hors d’oeuvres size and pan-fry the heck out of them in a cast-iron pan. Voila! 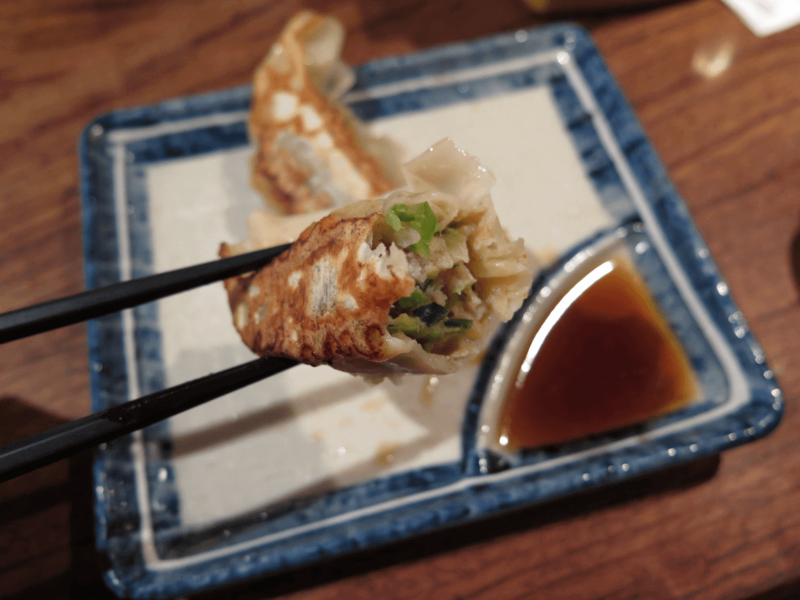 Gyoza aficionados will wax lyrical about the hane – this is the thin, crunchy film that you’ll see on these dumplings. Ideally, your dumplings will have crisp, lacy edges; they will look charred, but not burnt. When paired with a lightly vinegary dipping sauce and a dash of yuzu kosho pepper, Fukuokan gyoza are absolutely unbeatable. Try the ones at Temujin in Daimyo. This list is just beginning to scratch the surface of Fukuoka’s culinary delights, and you could easily spend several days here eating your way through its restaurants. Put this city on your Japan bucket list now!